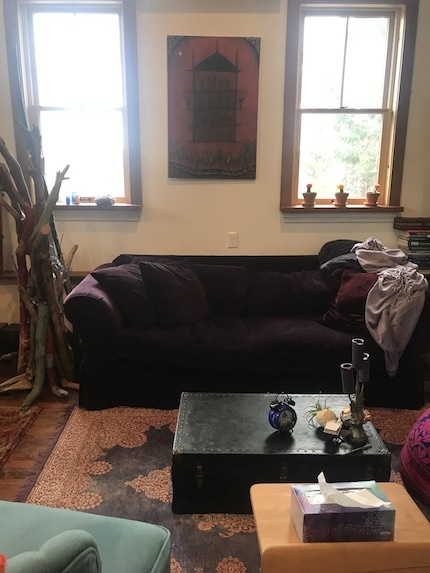 A mother and daughter, both therapists, practice from this home in Nyack. Susan Travis has been seeing patients for thirty four years in the wood-paneled front parlor. Her daughter Justine Girard, demonstrating just how close to the tree the fruit of her mother’s labor has fallen, operates from a studio behind the house. I spoke to both practitioners recently, encouraged to see how the thread of creativity and community, so emblematic of our village, are stitched together in both of their work. People interested in aging, the process of grieving, the arts, care giving/ burnout, and honing the tools we need to build and repair our own lives, will find their journeys edifying. 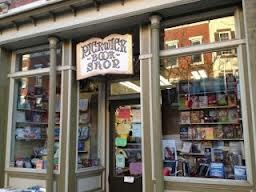 I understand that you are active in something called Creative Aging in Nyack? Susan Travis: Four years ago, I joined a group called Rockland County Village Community. A friend of mine, Sally Borgman, has been asking me to join things for the last 35 years and I’ve always said no. She said that this group just meets at a diner, Estrella’s, they say what they are grateful for and they have breakfast and that’s it. I said, I’m in. The mission was to help each other age in place of choice. You might not be able to stay in your home, but we wanted to help people go to where they want to go. by Susan Travis, LMHC, N.C.C. When did you write your book, Your Own Worst Enemy..NO MORE? I started in 2012, but my partner, Joseph, got very ill so I stopped writing for three years. I finally self published in 2016. It took three years. How does a person use the book? It’s easy to read and use. It describes four roles that people play, three unconscious, one conscious. The first role is how people make themselves a prisoner, the second part is about the prisons that people build to keep themselves as prisoners. The next section is about being our own jailers, and these are all unconscious roles that they play. The fourth role and my favorite part of the book is about the keys that you already have to free yourself from the prisons that others make or we make for ourselves. If they read nothing else, I hope they read the fourth section. There are 16 keys, (names) Master keys, the mind shift keys, the potential expansion keys and the spirit keys. People are amazed to see the prisons they have build. 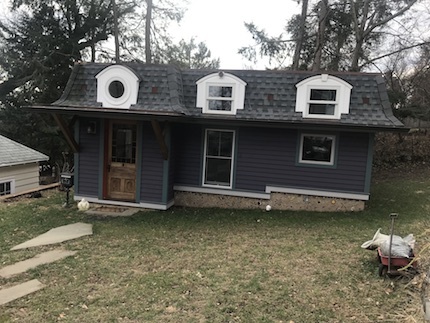 For more information you can reach Susan Travis at stravis.31@gmail.com or (845) 358-5560. We were invited to give a talk at the Nyack Library in 2017. I was one of the four people who spoke. Ann Morgan was in that group. Ken Balban and Jim Evers. When we spoke there, there was a man named Don Monaco, who came to hear it and he said he wanted to start a group in Nyack. And he got in touch with Ann Morgan. 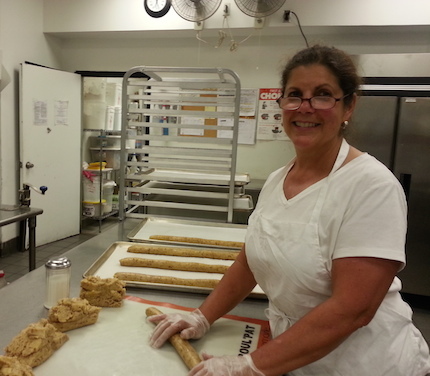 She left RCVC to work with Don to start Creative Aging in Nyack (CAN). Because I was part of the other group, and I knew her, she asked if I would be part of it. She contacted people that came to the original work shop and it started. We began getting out information to tell people we were only going to work with the 10960 area code. If you want to help each other age, you need to be geographically proximate. The library was kind enough to offer us the room every other Friday 2 – 3p. The next meeting of CAN is March 15, 2019. We formed groups to see what was needed. We looked into and joined village to village, which is the big movement that meets across the country. They help each other age in place. A big thing that we did was a survey, what do people need to be able to age in place. We then did a request to the group to see who was able to volunteer to help with all of these needs that people have. One of the interests was to go to the city and see something together, have a cup of tea, people wanted to connect to others. Some needed needed help with gardening, if they couldn’t do it themselves, or to help organize your house and get rid of things, help with technology or local errands. One member had broken her leg and needed someone to shop for her, drive her and take her to doctors appointments. It was amazing. Tell me about your Ask workshop? What we are finding from other groups that volunteers are coming forward, but people are reluctant to ask for help. So I did a workshop on asking. We need to reframe how people think of asking. They look at it as if they are a burden, or less then, that they should be independent. I reframed it. Maybe by asking you are giving someone the gift of being kind, that they have the pleasure of helping, of using a skill they have, acknowledging that everyone needs help. I made a mnemonic device for ask. I made buttons. My ASK stands for, Allow Someone’s Kindness. If you think of it that way, it’s not as hard. It takes away some of the burden. It begins an honest relationship. If we trust each other, I can ask and you can say no, that’s ok. When I ask and you’re able and willing, you’ll say yes, and we are having an honest relationship. CAN has 87 members. They don’t all come to meetings, but about 40 to 50 do attend. As a therapist, how does your work engage the question of aging? As a therapist, I don’t think it always directly does, but it engages change. Seeing yourself in a new place and discovering who you are there. Handling grief. I do a lot of grief work. There are a lot of losses as you age, as well as a lot of gains. But there are a lot of losses that you have to adjust to. One is a challenge to your fierce independence, another is seeing yourself as the person who had the job you had, and you no longer have that title or self-definition, how you once defined yourself. There is a loneliness, when people don’t connect. I deal with that it my practice. I’m going to do a workshop called Crossroads. We are at crossroads at different times in our lives. In aging, we come to a lot of cross roads. We have to grieve losses, recognize a need for change and start to create this time of your life the way you want to live it! My daughter Justine has a plaque that says “you don’t find yourself you create yourself.” In my work, I help people create themselves from where they now are and also, ask questions to explore the purpose of their life. People need meaning. Viktor Frankl said he survived the camps because he searched for meaning. I help people look at the meaning of their life and how they want it to be. How did this become the meaning of your life? I was guided to do it. This is my life work. I know it and I feel blessed that I know it. I’m here on earth to help people. The man whose car won’t start, the woman who needs the door held open, the people in my practice. That’s what I’m here for. Years ago, I was a classics major at Brooklyn College. In Classics, you have to wait for Venus to die to have a job, so I got married, and moved to Texas and I looked for a job. The state gives a Merit system test. If you took the test and passed it, you were a social worker. So I became a social worker for the Department of Social Services in San Antonio Texas, and the only thing I liked, was talking to the people and listening with them and trying to help them figure out how to solve their problems. I had to make budgets. I had to take kids out of homes, I had to look for shoes.., I hated that. Then we moved to New Hampshire. Merit system test again. I became a social worker there. Same story, the only thing I liked was talking to the people and helping them with their problems. Fast forward, I came here, my husband was the director the YMCA. The marriage didn’t last. I knew the marriage was fading. I had to support children, so I took another test, The Miller Analogy test. I did well, got into Columbia for counseling, a 60 credit program. I left after 34, I couldn’t afford it and I had to work. But I had a masters in counseling. I got a job at the Rockland County Guidance Center on Main Street, a career counseling center where I worked for 30 years. I did workshops on how to interview, how to feel good about yourself , empowerment workshops/ human potential seminar, 8 week seminar. To help people feel good enough about themselves, I wrote about 30 workshops while I was there that I created and created with others. The center started over Presidential Life, then two locations on Main Street, the one near the drum store for many years. The final location in Nyack was in the present Key Bank building. While I was doing it, I started a private practice that I have had for the last 34 years. Have you always seen your patients at home? Alway, in the front room. There’s a little bathroom. I sit with them behind these old wooden pocket doors. The second owner of this house was Dr. Morell. He bought this house in 1891. It was sold from the original owner Anna Stewart. She sold it to Dr. Morell for $1000. I always get great pleasure thinking that he saw his patients in the same room where I work. Did Justine see you practicing when she was a child? She saw clients coming in. When my son, Brendan was young, I had to teach people not to open my wooden pocket doors, but once he did and he saw me talking and he said. Mommy, your job is talking to people? I said yes. They pay you? I said yes. He said, that’s a good job. He was 7. Brendan owns a tea company with a friend from childhood Stefan Schachter. Yerba Mate, its a green tea. It’s called Eco Teas in Ashland Oregon. They deal with a farmer in Argentina. Justine Girard, when did you know you want to be a therapist? 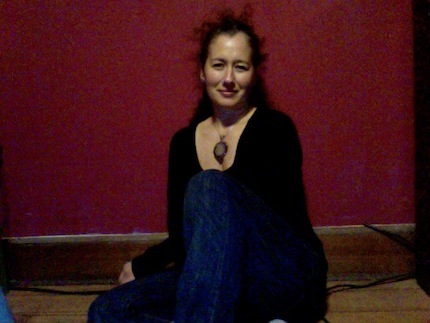 Justine Girard: In 1999, I joined an expressive arts therapy group in the city and it changed my life. I just felt like, one, I could do this, and two, I realized that it just wasn’t accessible to people. What was that first group like? I did it for four months and it helped move things that were stuck, that I could never really work through. 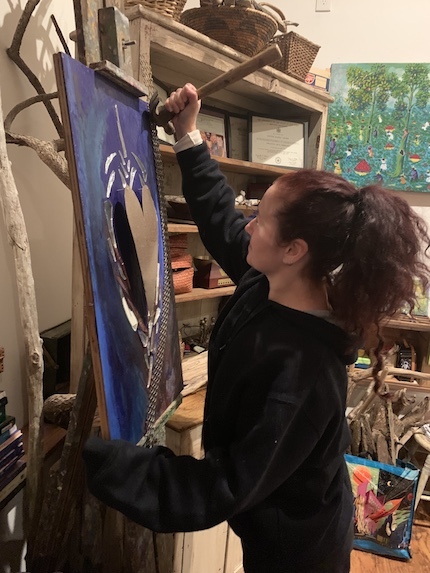 The use of movement and sound and visual art bypassed my defenses that allowed for a healing process that I wasn’t able to access in verbal therapy. Yes, I danced with the Debra Weiss Dance Company for ten years, but dance therapy did not resonate with me. Art making really shifted things for me as I worked through my own trauma. It’s expansive. Trauma happens to your whole body. Using the arts brings your body in. It can hold the vast range of emotions and experiences to match the trauma. Instead of getting stuck in the narrative. When did you start your studio? August, 2017. It took a year. It was a dream. 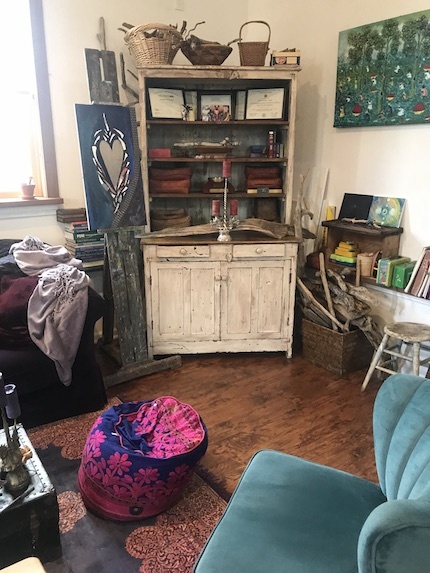 I offer a space that is warm and holding, but you can also get chalk pastel and paint on the floor. As an art therapist, do you have a particular population you work with? I work with adults, Men, Women, LBGTQ, individuals, couples, and groups, those who are open to the messiness of change and rediscovery and willing to find the strength in vulnerability and be open to playfully healing. How did you start specializing with care- givers? It’s evolved because I’ve done tons of internships. I had1,500 supervised hours. Through that experience, I realized that many care-givers were burnout out and lacked the time for self-care. There is no time to process or to decompress. What do you do with all of those emotions and the loneliness that you are exposed to working in these settings. Even though there are family visits, the people you are caring for are very lonely, there is not much you can do for that because you have to function as a professional. You still have to write your notes, you still have to go home and do your life. So, I was seeing this and thinking what are these people doing with all of these feelings. 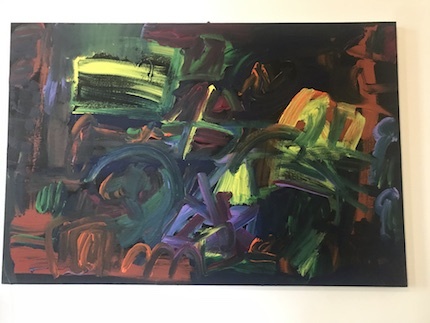 Witnessing the burnout out and the compassion fatigue, I realized that this was the direction I wanted to move towards in my practice, by developing an expressive arts therapy group for them. I’m good at holding the space for conflicting emotions and narratives. The use of art reveals the couple’s dynamic outside of their cyclical narrative that they may be stuck in. Art is a softer, safer way for the couple and therapist to see what is happening in the relationship. Art allows for the couple to be less defensive because the art itself offers a middle ground and facilitates new ways to communicate and see each other with fresh eyes. What is your work with groups like? Groups are three months long. They ebb and flow between a group process and art making that allows for insights, doing and undoing, reflecting upon where there is vulnerability and strength. For more information you can reach Justine @ blueglovegirl@yahoo.com or at (845) 353-1230. 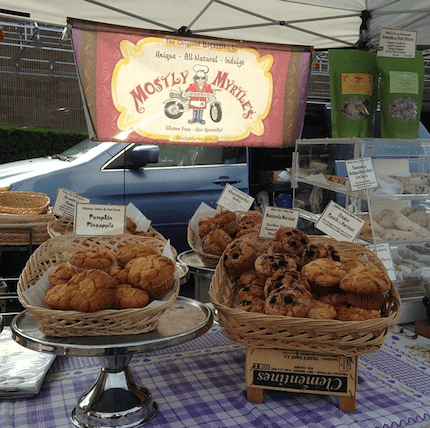 After 11 years of gluten-free goodness, Debra Sadowsky is retiring and her bakery, Mostly Myrtle’s will have their last week at the Nyack Farmers’ Market on February 28. You have just one more chance to enjoy her home-cooked delicacies, (but come early, because I might buy out her strawberry rhubarb muffins.) Here’s the story of a woman with great wit and culinary chops who will be sorely missed in all of the farmer’s markets where she has won a loyal following of satisfied customers. 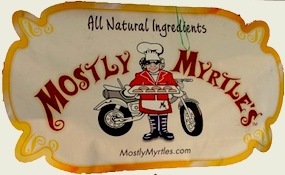 A woman standing in front of a motorcycle with a tray of cookies is the logo for Mostly Myrtle’s, the purveyor of gluten-free baked goods at the Nyack Famers’ Market. 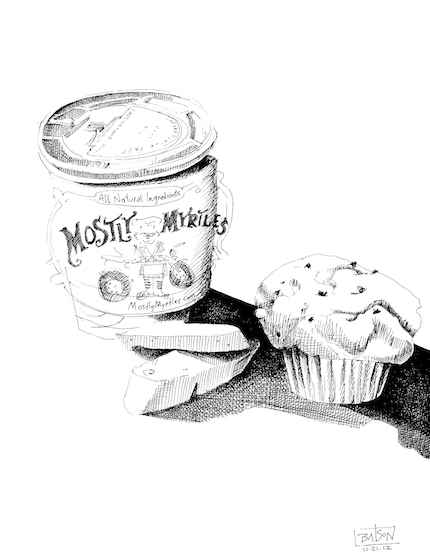 The image is an homage to the grandmother of Mostly Myrtle’s owner and baker, Debra Sadowsky. In order to keep up with the public’s growing appetite for gluten-free products, the former Occupational Therapist bakes up to 600 muffins a week for markets throughout the region. 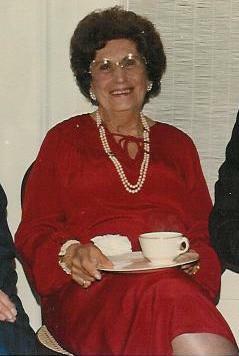 She was my very beloved grandmother, a strong, vital, and incredibly wise woman who was determined to enjoy everything that life had to offer. She was worldly and ahead of her time. But she also had this warm soft grandmotherly side. Her arms were always open for a hug and her hands were ready to create a scrumptious meal, or best of all, to make her cookies. Why did you portray her as a biker? I decided that we would have a likeness of her as our logo, but I wanted something that portrayed her whimsical and adventurous persona. I worked with a young man who was in my son’s high school senior class at the time and destined to follow his own dreams of becoming an artist. I told him I wanted her to be riding a motorcycle while holding a tray of cookies to show that she could do anything! Gluten is a substance present in cereal grains, especially wheat, rye,barley and spelt, that is responsible for the elastic texture of dough. There are basically 3 categories of people who avoid gluten. 1. Those who have Celiac disease, an autoimmune disorder which can occur in genetically predisposed people that creates inflammation in the small intestine, and damage in the lining preventing important components of food from being absorbed. Symptoms include digestive problems, skin rash, musculoskeletal problems, tingling sensation in the legs and other limbs. Research suggests that Celiac Disease occurs in as many as 1 in 100 people, however statistics are varied and researchers believe that as many as 2.5 million people in the U.S. may have undiagnosed Celiac. 2. Those that have the symptoms of Gluten Sensitivity but test negative for Celiac disease. 3. Those that choose to avoid Gluten for personal dietary reasons. What do you remember about her kitchen? We lived only about 10 blocks away from her tudor style “gingerbread” house in Kansas City, Missouri. She kept a key hidden in the little “milk door” in the back so even if she wasn’t home, I could ride over and find a tin of cookies somewhere in her kitchen or pantry. Tell me about your work before you became a baker? Occupational Therapy was my first love. I’ve always been drawn to the service and health arena. The holistic nature of Occupational Therapy fulfilled my desire to help people regain or attain their independence. 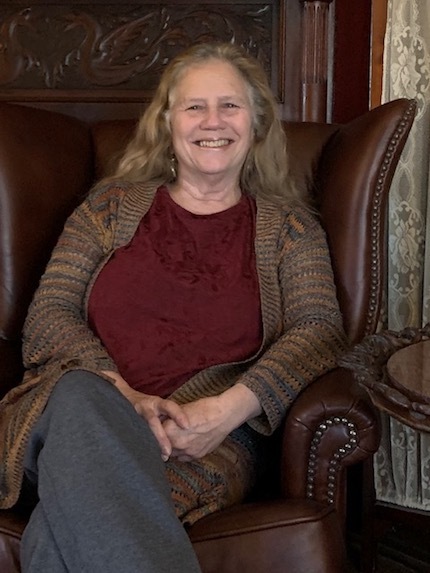 I worked as an Occupational Therapist (OT) in Adult Rehabilitation from 1976 to about 1985 and then moved to Pediatric OT, working with high functioning learning disabled students until 2007. When did you launch Mostly Myrtle’s? When I decided to create a company in 2002, I went knocking on doors to find a bakery that would rent me space to make my dream a reality. 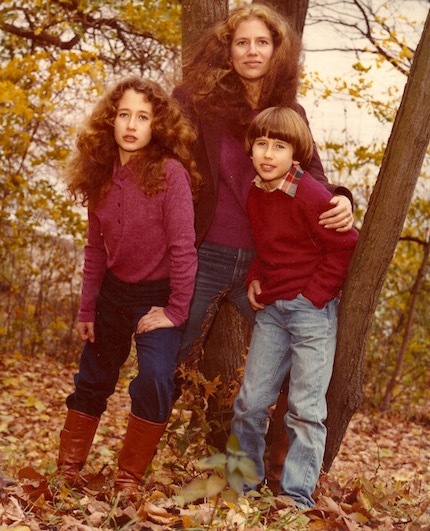 I was living in Long Island at the time. Best Bagels in Great Neck graciously welcomed me. No one thought that this Long Island woman would be able to take the “heat” that baking offers up on so many levels. The kitchen had this cavernous rotating oven, in which, on the very first day, I dropped a baking sheet into the fire. Their baking supervisor had to reach into the actual flames to retrieve the pan! Rob, the owner was a mentor to me and tremendous support as I made my way into small business. We remain friends to this day. I essentially knew nothing about commercial baking or about running a business either for that matter. I took a crash course in Entrepreneurism at the local Small Business Development Center and watched the bagel guys do their thing and just went in and practiced and practiced and practiced. I read about formulas and food science, joined a pastry organization, went to Trade Shows, and walked down every bakery aisle in every store in every city I traveled. Soon, I was less and less involved in my job as an OT. My fledgling company required all my efforts, so in 2007, I took a huge breath and quit my day job. At first, we were called “Nanny’s Cookies LLC “ but I changed the name to “Mostly Myrtle’s.” After all, Myrtle was my grandma and I am mostly Myrtle! Tell me about your signature product? It’s called a Biskooky. It’s a Biscotti/Cookie. In keeping with my grandma’s panache, we changed the spelling to Biskooky. Didn’t your grandfather invent something as well? My grandfather, Harry Rubinstein’s company was called Atlas Wire Products in Kansas City. 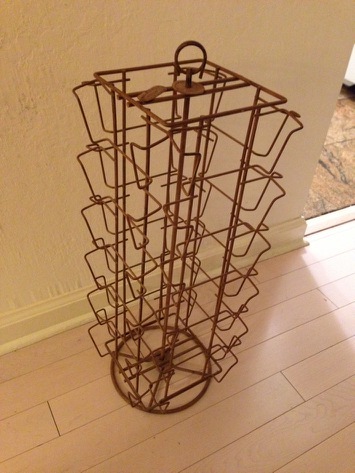 He invented and patented magazine racks & post card racks that became the industry standard. I worked there a couple of summers. My job was to manage the old-fashioned plug-in switchboard. What are some of the lessons from Occupational Therapy that help you as a small business owner? Understanding the need to move forward one step at a time towards ultimate goals and to appreciate successes regardless of the dimension. How many muffins do we make per week? Now that our business has grown into the production of gluten- free products with an unexpected emphasis on gluten-free muffins, we produce about 500 – 600 per week during farmers’ market season. We started with our zucchini, carrot, roasted apple, and blueberry muffins, which later became our Heavenly Harvest. We now have 8 varieties with additional seasonal favorites. I love getting inspiration from the Farmers’ Markets. We took those scraggy bulbous looking rutabagas from the market one week and added roasted onions and organic rosemary and created our most exotic muffin: Rutabaga Rosemary. Later we coupled sweet potatoes, organic kale and roasted onions for our Sweet Potato Kale Muffins. Didn’t you recently become a grandmother? Would you want your grandson to continue the family business? You must know that my heart filled with love when you mentioned my grandson. And… I giggled at the thought of little Henry carrying on this specialty baking business. At 19 months old he was already calling Grandma Kooky. Visit Mostly Myrtle’s for more information. This year, St. Philip’s A.M.E Zion Church on the corner of North Mill and Burd Streets celebrates 160 years of worship. The church was founded in 1859, two years before Abraham Lincoln was sworn in as president, by abolitionist John W Towt. In the 1850’s, as slave catchers roamed the north empowered by the loathsome Fugitive Slave Act, abolitionists faced legal jeopardy and mortal danger. It was under the gathering and ominous clouds of a civil war over race based slavery that Towt arrived in Nyack determined to contribute to the welfare of the black community. In 1821, the 19 year old white Methodist was exposed to the cruel perversion of slavery while traveling through the south. Towt settled in Nyack in 1859 after a successful career in New York City where he amassed a fortune. He immediately threw himself into the effort to ensure that there was a Sunday school for black children in the village. At the same time he made arrangements to secure property for a church building and accommodations for a minister. It is not surprising that the church that Towt would help establish was of the African Methodist Episcopal Zion denomination. 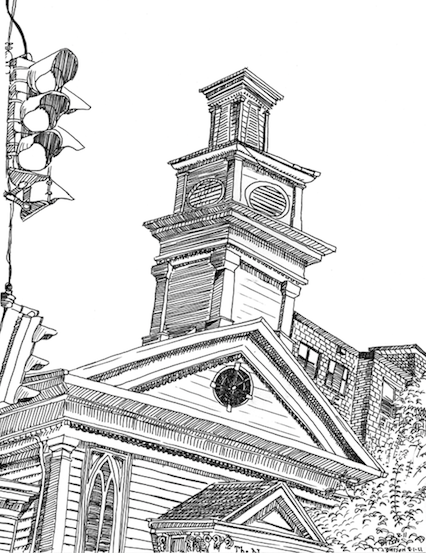 The A.M.E. Zion Church was founded in New York in 1796. From its inception the church was an active participant in the Underground Railroad and counted Harriet Tubman, Frederick Douglass, and Sojourner Truth as members. Although Towt played many roles in the congregation including superintendent of the Sunday School, the day to day operation and religious activities of the church were led by members and pastors of African decent. 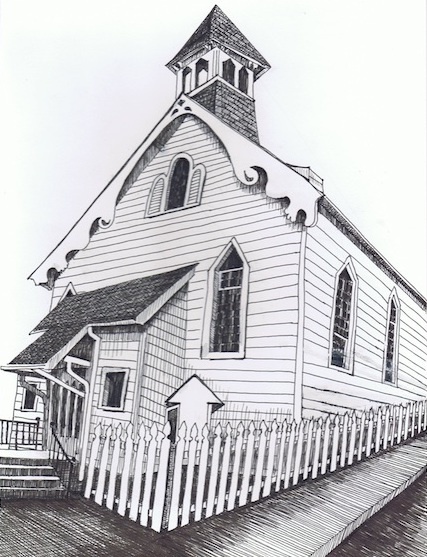 The enduring wooden edifice at the corner of Burd and North Mill Street is evidence of the prudence and probity of the congregation. At a meeting in early 1886, the chairman of the building committee, William H. Myers, argued against repairing the church and asked all those in favor of building a new church to stand. The whole congregation rose to his challenge. My great grandfather, George T. Avery, was one of those who stood up. As the Chairman of the Board of Trustees, he contributed $36 towards the $2,311 that was eventually raised. The building that was dedicated on Sunday December 17th 1886 was of such solid design and durable material that it still stands. Mr. Towt made his last public appearance in the pulpit of St. Philip’s on September 11, 1887. He was said to have been pleased with the results of his 28 years of collaboration with Nyack’s black community. He told those assembled that as its founder, he felt doubly repaid by the fact that his efforts had not been in vain. In his definitive examination of local race relation, Nyack in Black and White, Carl Nordstrom cites a 1959 St. Philip’s Centennial Souvenir Journal as a source of some of his research. I was fortunate enough to recently obtain a copy from current St. Philip’s congregant Hazel Lancaster. Her husband, Earl, was the chair of the centennial committee. Within the pages I counted four generations of my family. There was an historical photo of my Great Grandfather, George T. Avery; his daughter, Frances Lillian Avery Batson, who was a Secretary of the Trustee Board: my Aunt, the former Deputy Clerk for the Village of Nyack, Frances Adeline Batson photographed during a Sunday school class that she taught, with her daughter, my cousin Sylvia Peterson, sitting on her lap. The pulpit of St. Philip’s seems to attract ministers that John Towt would admire: individuals dedicated to the advancement of the black community and drawn from the A.M.E Zion tradition. The first pastor that I remember from my childhood was Rev. Petty D. McKinney who led the church from 1962 until 1968. McKinney’s first year in Nyack was interrupted by return trips to Florida where he had to face unlawful assembly charges from his participation in the Freedom Ride movement. Reverend Jairite Anderson-Cole was appointed Pastor of St. Philips A.M.E. Zion Church in Nyack, New York. June 2016. In 2010, Rev. Cole did her trial sermon at Greater Centennial AME Zion Church in Mount Vernon, NY under Rev. Dr. W. Darin Moore, who is now the Presiding Prelate of the Mid-Atlantic Episcopal District AME Zion Church. Few buildings celebrate 160 anniversaries; even fewer organizations reach such an august milestone. The spirit of those who endured slavery and those who risked their life, freedom and property to abolish the barbaric institution survive through the longevity of St. Philip’s A.M.E Zion Church. Like an eternal flame, the ideas of freedom and self-determination that John W. Towt enshrined in this humble wooden building have been diligently tended by generations of members of the St. Philip’s family. May they never be extinguished. The Knowledge Market opens its doors for the first time tonight, February 5 at 7pm at the Nyack Center. Meet experts from our village who will describe the classes, discussions, and interactive workshops that will be offered in this information boutique curated by NyackNewsAndViews. Classes begin Thursday, February 21 and run through March 14 with morning or afternoon sessions. Operating contemporaneously with the Nyack Farmers’ Market, you can now get fresh produce and baked goods for the table and food for thought under the same roof. Find out how you can participate, hear from the presenters, mingle with neighbors, and enjoy music from Jeff Rubin and refreshments from La Talaye Catering & Event Design. Admission is free and your rsvp is appreciated: http://www.nyackknows.com. Here are the courses and inaugural instructors. 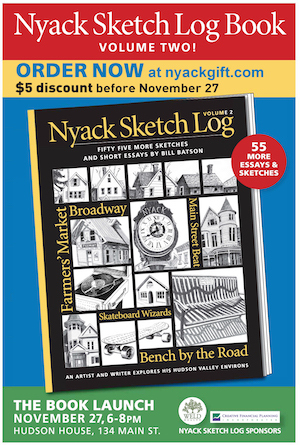 Bill Batson, author and artist of the weekly Nyack Sketch Log on Nyack News And Views, has published an original sketch and essay about the Village of Nyack every Tuesday since 2011. 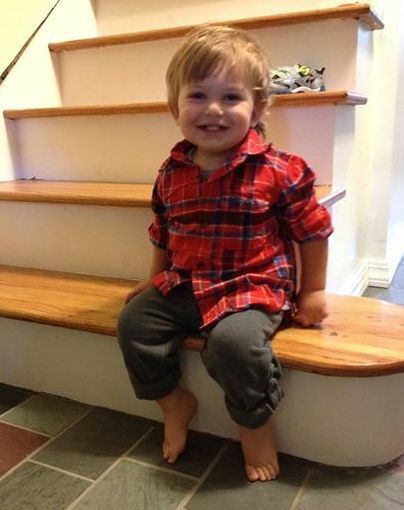 His family has been in Nyack, New York, since the 1890s. 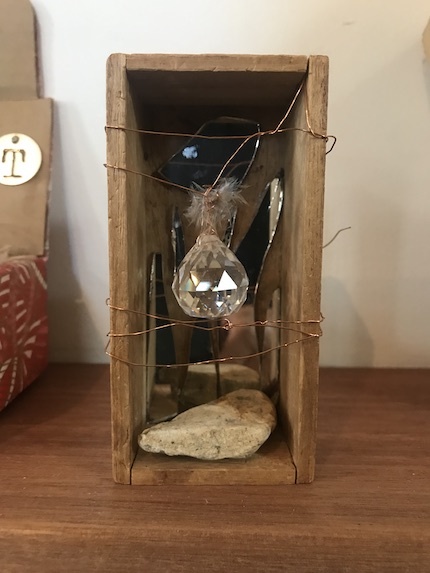 Bill serves as the Marketing Manager for the Nyack Chamber of Commerce and the Artist-In-Residence at the Nyack Farmers’ Market where he sells and makes art, organizes events, and develops promotional tools for the Chamber. Bill is an advisor to the Nyack Center, a trustee of the Historical Society of the Nyacks, and the chair of the Nyack Commemoration Committee, a group that erected a Toni Morrison Society Bench by the Road monument in Memorial Park in 2015. From his Nyack Sketch Log column, the Flash Sketch Mob, a crowd sourced, en plein air landscape art project, and the Nyack Record Shop Project have sprung. Antigone on Robben Island—Mandela Takes the Stage, a play by Samuel Harps, was inspired by one of his columns. A lifelong artist and activist, Bill is dedicated to using the arts to promote preservation, commemoration, cultural education, and community empowerment. To learn more, follow his weekly column or visit billbatsonarts.com. Michael Hays is a local history fan and digital photography enthusiast who writes the Nyack People & Places column on Nyack News And Views. Retired from a career in educational publishing, he is President of Rockland Bicycling Club and a member of the board of directors from Marydell Faith & Life Center and Johns Hopkins University Press. His photos appear on IG @uppernyackmike. Jeff Rubin has been in the music business for 48 years. He has performed, recorded or toured with Oingo Boingo, Danny Elfman, Randy Jackson (American Idol), Concert For Bangladesh Band (Dhani Harrison), Chuck Berry, Davey Jones, The Temptations, The Crystals, The Drifters, The Regents, The Dupree’s, Freddy Cannon, Del Shannon, Leslie Gore, and more. Currently gigging around the New York area as “Jeff Rubin Solo Artist,” the “Jeff Rubin Band,” and with a reggae band called “JLP and the Bad Ideas,” he continues his diverse career. He is a veteran teacher from Alto Music, where he began instruction in 1980. A recording engineer and Mac guru who produced “The Pipeliners (2014), Jeff also builds guitar and bass amplifiers, effect pedals, even microphones, bringing technical expertise to his comprehensive understanding of guitar and the music business. He was featured in the Nyack Sketch Log, Volume 2. 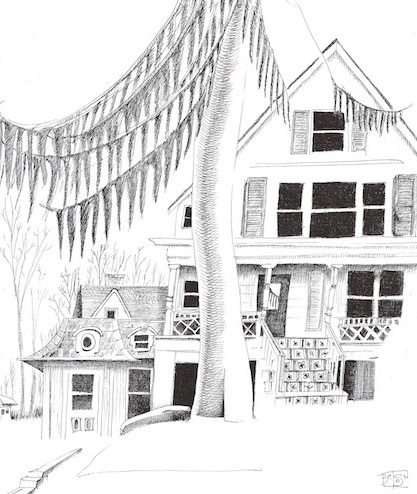 Bob Timm is a Nyack resident, father, musician and a published poet. He studied poetry with Allen Ginsburg at the City University of New York and was an original founding host of the NY College Poetry Slam at the Bowery Poetry Club. He has been a nominee for the Pushcart Prize, and has served as editor for Poetry New York and Rockland’s River River literary journal. Her new restaurant, Cafe La Talaye will have its grand opening on Friday, February 8, 5-8p at 3 Main Street in Haverstraw. To learn more about Chef Michelle visit latayale.com. Every week, Michelle Timothee puts on a virtual cooking clinic at the Nyack Farmers’ Market. With produce purchased just steps away from her booth, Chef Michelle creates fusion meals that combine the cuisine of her childhood in Haiti and the skills acquired at Rockland Community College and the Culinary Institute of America in Hyde Park. Her recipes, complete with a list of locally-sourced, seasonal ingredients are often published in the farmers market weekly newsletter. When Timothee first arrived in Nyack in 1998, she was reminded of the hilly landscape of Petion-Ville, Haiti, where she opened her first restaurant. Entranced by the landscape and the warm embrace of a significant Haitian population that began arriving in Nyack in the 1960s, Timothee is now expanding her culinary enterprise. 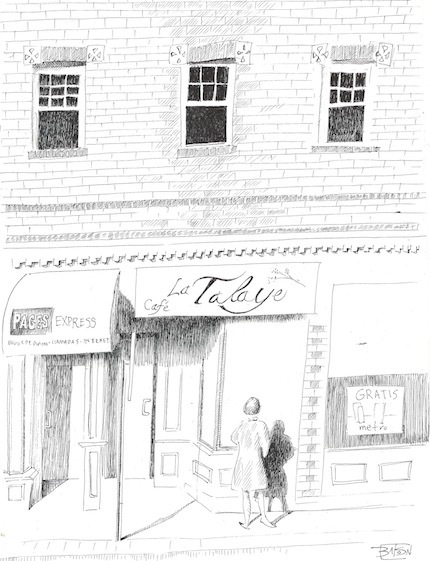 On February 8, she will open La Talaye Cafe at 3 Main Street in Haverstraw. 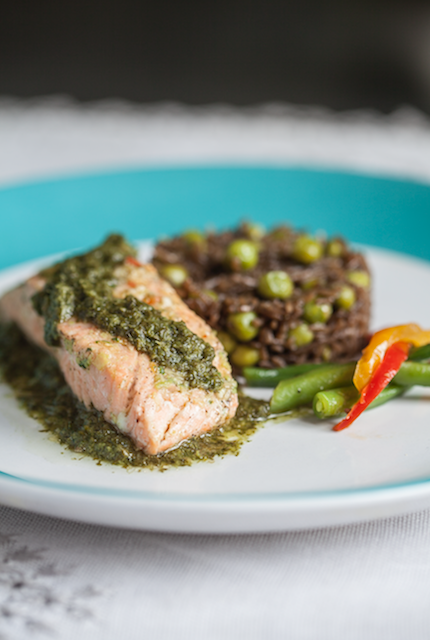 If you haven’t yet tasted her Caribbean-infused fare, you have three chances this week, all at the Nyack Center: Tuesday Feb 5 Knowledge Market Kick-off event at 7p, each Thursday from 8a – 2p at the Farmers’ Market and at Saturday’s reception before the annual Black History Month Celebration from 6:30 – 7:30p. Nyack Sketch Log managed to put down the fork long enough to conduct this interview. What does La Talaye mean? 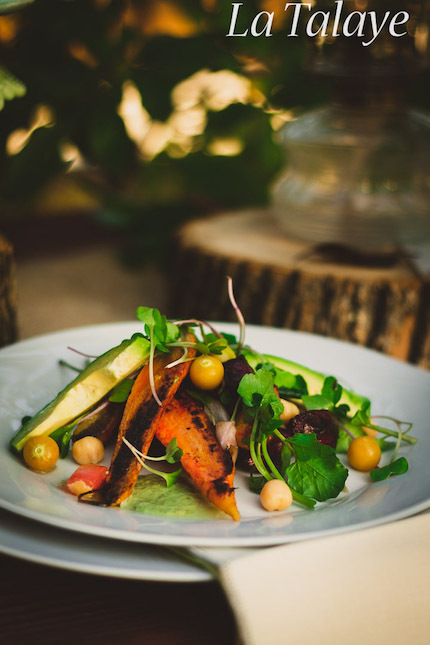 Here are four opportunities to taste the delectable dishes served by Chef Michelle Timothee. Chef Timothee has served as the chef-in-residence for the last five years. Chef Timothee is a sponsor and will be catering the reception. The proper name is Saint-Michel-de-Attalaye. It’s located on the Central Plateau of Haiti. It’s very beautiful with farmlands and mountain in the distance. It’s where my parents and grandparents are from. Inspired by watching my grandmother cook with seasonal ingredients, I add in my own touches of ginger, garlic, lime, turmeric, thyme, rosemary, scotch bonnet peppers and curry. Did you have a restaurant in Haiti? Yes, I had a restaurant in Haiti at the time of the invasion 1993, (NSL: when the United States overthrew the government of democratically elected President Jean-Bertrand Aristide) where I had to meet people from all over the world from organizations, embassies, humanitarians… little babies to dogs and so on. I needed better health care for my son. When Did you Join the Nyack Farmers’ Market? Five years ago, I came to the farmers market and was so excited. I talked to Pam right away. All my vegetables come from the market, my honey. I also go to Rockland Alliance. I’ve picked some produce right out the ground. Between Bloooming Hill and Madura, and Taliaferro is where all vegetable. What has been the greatest challenge in launching a restaurant? When did you become the Chef at the Marian Shrine? I became a chef at the Marion Shrine in 2011 I make holy dinner for the priests and brothers.F or the past 6 years, I have been volunteering my time with my son cooking Thanksgiving Dinner for the community at the retreat center at the Marion Shrine. 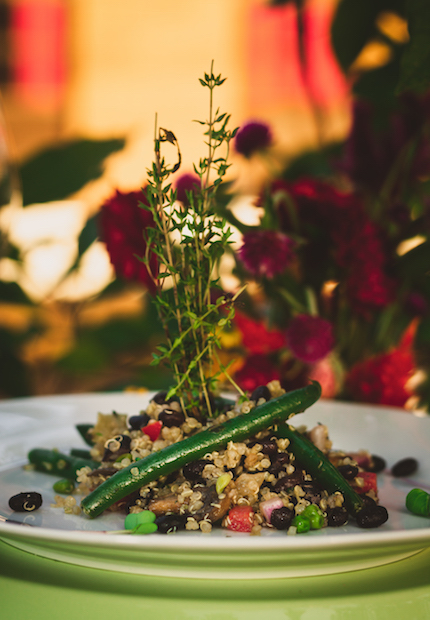 My cuisine is unique… delicious fresh, colorful and healthy creative choices -a fusion of contemporary and innovative dishes and more favorites. I season everything I cook with love! Who helped with the decor and design of the restaurant? The decor is a vivid imagination of my home land, special touches from my parents house in Haiti where I grew up , my old apt in the states, the farmers markets (women in Power) and my Cousin Gary helped me with the design. How do you stay in contact with the Haitian community in Rockland? Attending community events, churches and support their businesses. What are some of the more interesting catering jobs you’ve had? Colleges, Commanding general retirement party at West Point military academy. When were you home last? What’s going on in Haiti today? 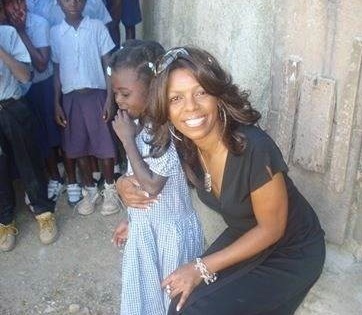 I was home in 2009 to feed some kids in St Michel De L’attalaye for Christmas literally 2 weeks before the earthquake. Haiti today is still striving for success, warm and the beauty in everyone heart keeps the county alive regardless of challenges the country has encountered within the past 9 years. With faith and hope every goal is achievable. I’m going to become a herbalist. I am studying at the Herbal Academy. Were it not for an assassin in Memphis in 1968, our nation’s Nobel Prize winning champion of nonviolence would have turned 90 years old today, January 15, 2019. In a time of voter suppression and the deployment of crude racial stereotyping to distract from the growth of a foreign-influenced kleptocracy, the annual remembrance of Rev. Dr. Martin Luther King, Jr. is more urgent than ever. In Nyack, there are two wonderful celebrations of King’s life and legacy on Monday, January 21 at St: One at the St. Charles AME Church at 432 Valentine Avenue, Sparkill (9:00am) and the other at Pilgrim Baptist Church at 80 N. Franklin Street, Nyack (2:00pm). Dr. King famously observed that “the arc of the moral universe is long, but it bends toward justice.” The results of a mid-term election in 2018 that seated the most diverse Congress in history is strong evidence that King’s maxim is true. 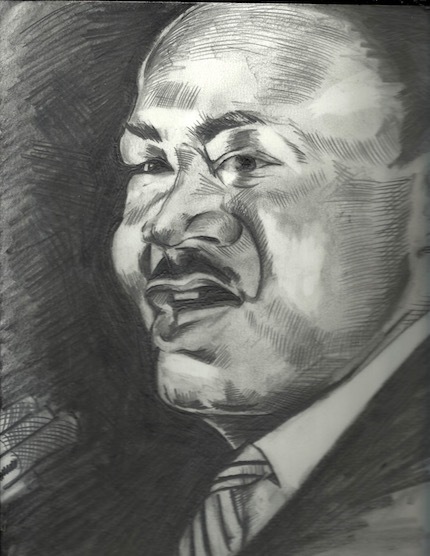 Here are four essays and sketches published to celebrate King’s legacy over the last eight years of the Nyack Sketch Log. Below find a link to each. Whether you are commemorating the day through service, or at a public ceremony, the value of having an annual opportunity to refocus our eyes on the prize of social, political and economic equity becomes more apparent. This is the house where Martin Luther King would have slept. Were it not for an assassin in Memphis in 1968, our nation’s Nobel Peace Prize winning champion of nonviolence would have made it to Nyack. The purpose of his visit would have been to commune with the Fellowship of Reconciliation, an organization that shared his philosophy and stood with him during his defining struggle. Would you be surprised to know that Dr. Martin Luther King Jr. applied for a concealed carry gun permit? In his fascinating essay “The Secret History of Guns, Adam Winkler recounts that after King’s Montgomery, Alabama home was fire-bombed in 1956, he applied for a pistol license. Less shockingly, he was denied. If King had not been shot down in Memphis, Tennessee in 1968, he would surely be speaking out for gun control today. Detractors might have tried to use his Alabama gun application against him. I would have argued that this fact made him an even more reasonable advocate for sensible reform. His voice is sorely missed. I was born in the interval between the March on Washington on August 28, 1963, where Martin Luther King Jr. gave his “I Have A Dream” speech, and the bombing of the 16th St. Baptist Church in Birmingham, Alabama on September 15, where four little girls lost their lives. America was at a perilous crossroads. These two months were a time of great uncertainty for our nation: would we embrace Dr. King’s enlightened vision of interracial cooperation, or descend into the anarchy of violence motivated by racial animus? Every time I passed this sign, I struggled to decipher the mysterious acronym. Not knowing the meaning of the hieroglyphic written in glass neon tubing gnawed at me. And when I finally obtained the answer, I was launched on another voyage of discovery. What on earth was the Independent Order of Odd Fellows and what did they do inside this building at the corner of Franklin and Main Streets? This three-story brick structure was erected in 1895 as the local lodge for the international fraternal organization. The etymology of the name is more mundane than the evocative word “odd” promises. Fraternal orders were originally organized around a particular trade, like the Freemasons who were drawn from Masons. Odd Fellows drew their members from various or “odd” trades. 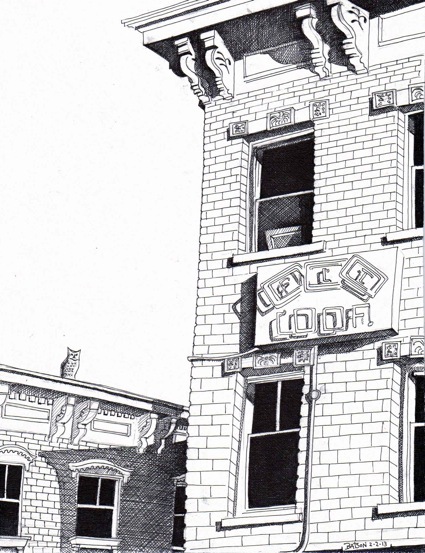 The first Odd Fellows lodge was established in England in the 17th century. The group’s American presence was established in Baltimore in 1819 as an altruistic social organization. When the Nyack lodge was dedicated, the Odd Fellows claimed to be the largest international fraternal organization in the world. Support for the veracity of the boast comes from Kjeld Tideman, a painter who had a studio in the building in the 1980s and 90s. Kjeld (pronounced Shell) had a childhood memory of seeing an I.O.O.F sign in Oslo, the capital city of his native Norway. When he was setting up his painting studio, he found daguerreotypes among artifacts left behind by the group that gave the appearance that the entire white male population of Nyack belonged to the Odd Fellows. Several facts about the Odd Fellows distinguish the group from other fraternal organizations. They were the first to accept both men and women in their ranks, and they were the first to build homes for orphans and the elderly. Illustrious past members include Ulysses S. Grant, Wyatt Earp and Charlie Chaplin, an assortment of fellows that some might find odd. There are still Odd Fellows organizations operating in 29 countries. Nyack’s lodge closed decades ago. 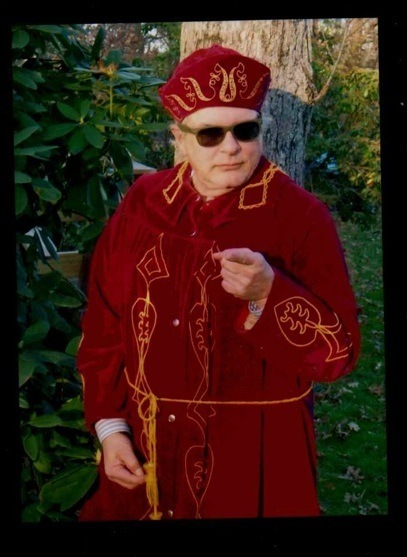 But with theatrical garments, resplendent with elaborately mono-graphed cloaks, upside- down-ice-bucket-shaped-hats, and matching collars and cuffs, the Odd Fellows are very similar to their sibling service clubs. 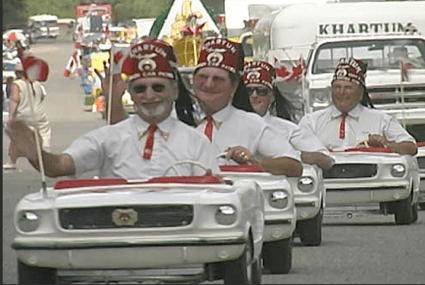 However, they had nothing to compete with the off-beat practice of the Shriners to appear at public events in miniature cars. I guess if you fund children’s hospitals, you amass the social equity to parade around in whatever strikes your fancy. The man who solved the riddle of the defunct neon Odd Fellow’s sign for me was Philip Biagioli. A transplant to Nyack from the Bronx, Biagioli, used to pass a similar display near the Whitestone Bridge. 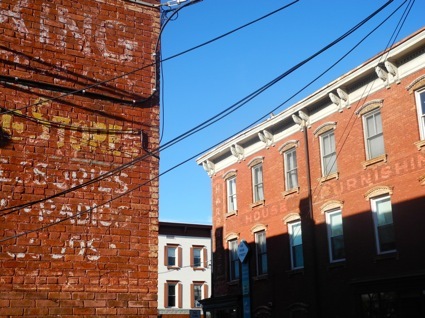 Biagioli, who worked as coordinator of media services for Rockland Community College is the local champion of a national movement to preserve ghost signs, the vanishing commercial messages that are decaying in plain sight in cities across America. In his campaign to save the numerous ghost signs in Nyack, like Havermales Hardware’s fading advertisement that is across from the I.O.O.F sign, Biagoli hopes to enlist the support of Frank Jump. Jump is the author of the book Ghost Signs of New York and publisher of the Fading Ad Blog. In an interview with the New York Times, Jump explained. “The sense of urgency I felt every day drove me to document New York’s fading advertisements, and capture the marks left by artists and artisans, most long since dead, who spent their lives painting huge commercial murals over the last 150 years. As bland, crassly commercial and irrelevant as a sign that lists the items available for purchase at a hardware store that closed decades ago may be, there is something unnerving about a landscape that is constantly in flux. Freezing the process of public entropy of these signs creates monuments of local archeology that connect the multiple generations that have shared and shaped our village. However, Biagioli would like to see the power restored to Odd Fellows sign. His affinity with the group was on display in his recent Christmas card, where he donned the fraternal order’s ceremonial garb. The tubes that once carried illuminated neon gas in the service of spreading the Odd Fellow message have survived intact. This restoration project should not offend the purists: It doesn’t need new paint, just a visit by an electrician and the flick of a switch, and voila, the gateway to our downtown business district would have a distinctive historically significant beacon. And as a landmark, Nyack can be proud of the sentiment behind the motto emblazoned on the Odd Fellow’s antique electric billboard, represented by the letters F.L.T: Friendship, Love and Truth.